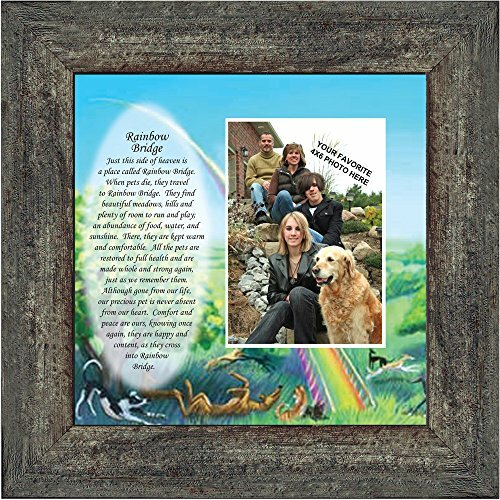 Picture framed poem about a deceased pet and the love still felt for them. Sympathy gift, gift for someone who lost a pet. Personalized Picture Frame for home décor for wall or table top display, Glass, Easel Back with wall hanger.Picture opening for you to add your own picture is 3.5" X 5" which works great for 4 X 6 pictures. Barnwood Frame size is 10" X 10". Made in the USA. Picture framed poem about a deceased pet and the love still felt for them. Picture opening for you to add your own picture is 3.5" X 5" which works great for 4 X 6 pictures. Barnwood Frame size is 10" X 10". If you have any questions about this product by Personally Yours, contact us by completing and submitting the form below. If you are looking for a specif part number, please include it with your message.